The ASHES hydrothermal field is located near the base of the western caldera wall of Axial Seamount at a water depth of 1552 m. It hosts numerous active hydrothermal sulfide chimneys, myriad lower temperature diffuse flow sites, and abundant vent biota. The focused study area is at the ~ 4 m tall actively venting sulfide chimney called “Mushroom” and a diffuse flow site adjacent to the base of the chimney. 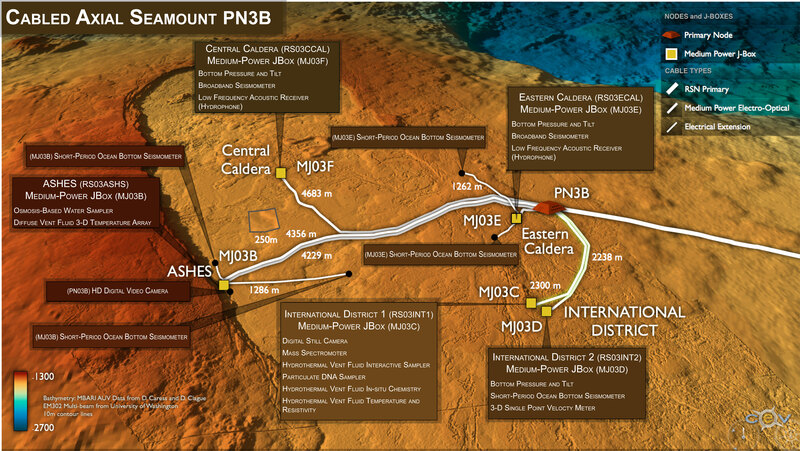 Instrumentation at this site is focused on understanding linkages between local and far-field seismic events on fluid chemistry and temperature, chimney evolution, and impacts on vent biota. Seafloor instruments at the ASHES site are attached to a Medium-Power J-Box (MJ03B) through a series of extension cables. An ~ 4 km long extension cable from Primary Node PN03B provides the JBox with significant power (375 v) and bandwidth (1 Gbs) to operate the instruments and transmit data to shore. In addition to geophysical and temperature monitoring instrumentation attached the MJ03B JBox, the site also hosts a high definition video camera, linked to shore via a separate fiber optic cable that provides 10 Gb bandwidth from PN03B. This allows full resolution video to be transferred in real-time to shore, along with communications for pan and tilt capabilities, as well as lights.